Scientific knowledge is essential to support and improve decision-making that successfully implements the 2030 Agenda and reaches the goals of the Paris Agreement. Considering the tight time scale of these political frameworks, the scientific community is challenged more than ever to provide answers of the world’s biggest societal and environmental problems. Today, science faces three big challenges (1) assessing and communicating the science generated over the past 20 years, (2) defining and closing knowledge gaps, and (3) generating (new) knowledge together with relevant societal actors in the context of global sustainability. In addition to national and regional approaches some challenges benefit from international networks advanced by WCRP and Future Earth. 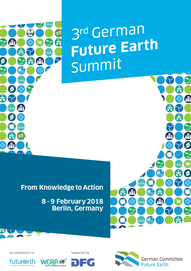 The first German Future Earth Summit focused on new areas for integrated science for Germany; the second Summit addressed the cross-cutting issues around theory, data and assessment while this third Summit will focus on Knowledge-Action Networks (KANs). KANs are expected to create and provide a creative environment for science and stakeholders to advance integrated knowledge generation on global sustainability. 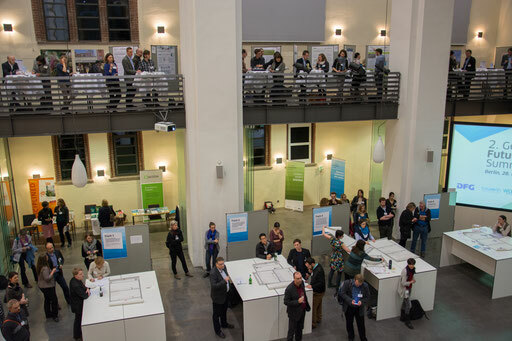 The German Committee Future Earth supports these international efforts and provides a platform for German researchers working on global sustainability. Moreover, the German Committee Future Earth partners with the solution network SDSN-Germany and supports science informed decision-making via the newly established ‘Science Platform Sustainability 2030’. Together with the scientific community we want to develop and explore possible new research directions in Germany and beyond, to advance the idea of global sustainable societies. Science across the KANs is highly integrated. The KANs will build on fundamental and solution oriented research, and focus on topics such as Health, Natural Assets, Ocean, Sustainable Consumption & Production, Sustainable Development Goals, Transformations, Urban, Water-Energy- Food Nexus, Finance & Economics. The German Future Earth Summit will provide an opportunity to network and exchange ideas during sessions, roundtables and research posts. We warmly welcome contributions to all these fields. We cordially invite you, the German Future Earth and WCRP community, and others interested to discuss research in the context of the 8+ Knowledge-Action Networks. Save the date! We look forward to your participation and lively discussions! stakeholders from politics, economy and society. From consumption and production, decarbonisation, extreme events to SDGs to education, the research blog posts focus on many exciting topics. We have updated our conference program! Click here to find more details about speakers, session topics and workshop organisers, etc. Please check your inbox for email notification and contact us if you have not received a confirmation! New deadline for session proposals, roundtable discussions and research posts is 15.10.2017! Deadline for Session proposals, roundtable discussions and research posts is 8.10.2017! We have two new KAN topics included!